When a user types name and e-mail in a campaign, the user can see an error message if they didn't type the information correctly. For example if they forget to use '@' when entering their email, an error occurs. In the example above I am visiting a Danish website and the browser's selected language is Danish. 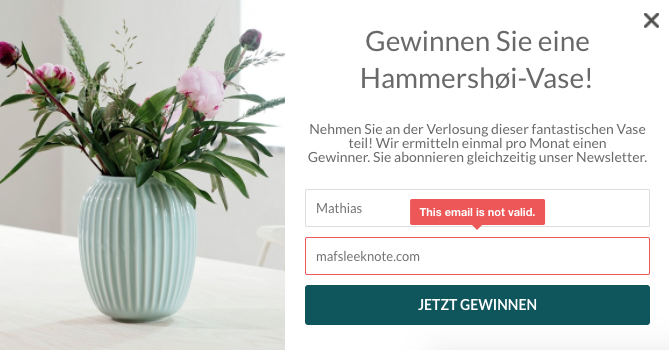 Here is an example from a German website where they've made a SleekBox in German. Here I will still see the Danish error message. The reason for this is, that the SleekBox decides your language based on your selected browser language. If you change your browsers language to German you'll then always see the error message in German, no matter what language the website has.